Reynolds 853 frame, time trial, silver solder brazed lugless. Red, White and blue. Campagnolo chorus 10spd group set, campagnolo vento wheels, with gp4000s tyres. Specialized romin saddle. Frame size: seat tube 54cm, top tube 55cm ctc. Let me know if you need any more information. I really appreciate you helping to spread the word. 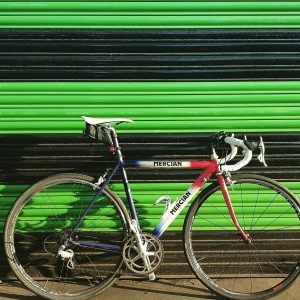 Please keep a eye out for this bike and contact your local police if seen .